Another year has once again passed us by and a new year begins. I want to encourage you to start the year with HOPE. 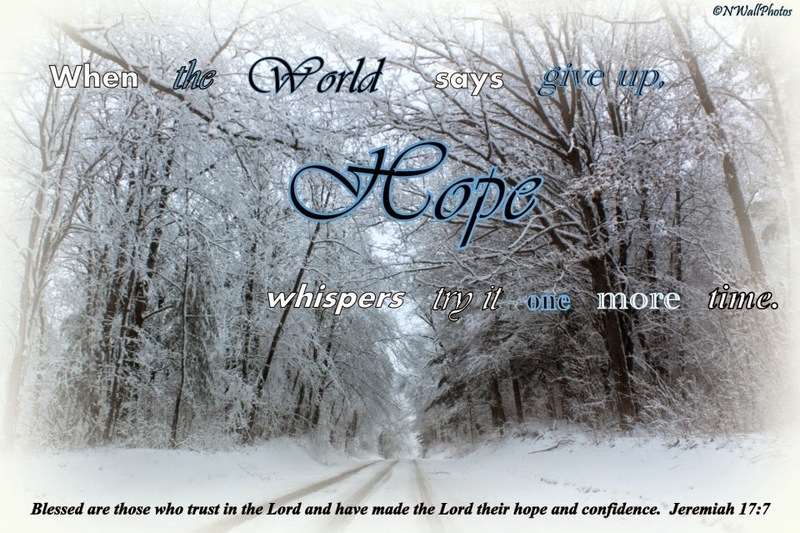 The word hope appears many times in the Bible, and reading about it gives me just that. Here is one encouraging example: Romans 5:1-5. "Therefore being justified by faith, we have peace with God through our Lord Jesus Christ: By whom also we have access by faith into this grace wherein we stand, and rejoice in hope of the glory of God. And not only so, but we glory in tribulations also: knowing that tribulation worketh patience; And patience, experience; and experience, hope: And hope maketh not ashamed; because the love of God is shed abroad in our hearts by the Holy Ghost which is given unto us." The dictionary definition of hope is "a feeling of expectation and a desire for a certain thing to happen." What are we hoping for in 2015?